Armadillos are usually classified as a pest species due to their habit of digging and burrowing. How Do you Get Rid of Armadillos? There's really only one way to go about it. You've got to catch the armadillos and relocate them off the property. There's no other good approach that I know of. Maybe having a big, scary dog would help. But otherwise, this is a nocturnal animal that comes along into your yard or landscaping for just a short time every night or so, and digs a bunch of holes while looking for earthworms and grubs. There is no effective repellent that'll keep them away, nor any device that will discourage them from entering the yard. A sturdy fence, one that goes into the ground that they can't dig under would do as well. But if that's not an option, you just need to set some traps, catch them, and relocate them at least five miles away. Of course, trapping is tricky for a novice. HOW DO I REMOVE THEM MYSELF? There's a reason professional wildlife trapping companies exist. First of all, it's probably illegal for you to trap and remove and relocate armadillos on your own in the state you live. As a non-indigenous species, it's often illegal to relocate armadillos. Most private citizens don't have the means to humanely euthanize trapped wildlife and properly dispose of or cremate the carcass. Other regional laws regarding wildlife trapping may prevent you from self-trapping as well. Second of all, for those that lack experience, it's not very easy to trap armadillos. One of the most common questions that I hear from annoying do-it-yourselfers all across the country is, "what kind of bait should I use to trap armadillos?". The answer is that there is no bait that will make an armadillo enter a trap. Armadillos dig up worms and grubs from under the ground. They eat live insects. The will not eat any old food sitting on the surface of the ground. As usual, I've heard a bunch of old-wives suggestions on bait: old cabbage, rotten bananas, a stocking full of earthworms, etc. Go ahead and try these: you might get a stray opossum, but you won't lure in an armadillo. The key to trapping armadillos in cage traps lies in reading the subtle (and in some cases, not-so-subtle) clues that the animal leaves behind, and placing the traps just right - in the right areas, facing the right way, with the right stability, dirt padding below, etc. etc. Furthermore, a good wildlife trapper will use the animal’s behavior - its tendency to move along edges and bump along barriers in order to properly finish off the set and steer the armadillo in the trap - the trap alone is not enough. A professional will also set several traps on the property if need be, to increase the odds. Armadillos are unique animals for many reasons. The first noticeable thing about this animal is the "shell" - a collection of flexible bony plates that cover all but the belly of the creature. 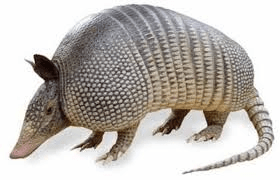 The armadillos in North America are called Nine-Banded Armadillos, because they have a certain number of segments, or bands, of the bony shell across their back. The segments give the animal some flexibility, maneuverability, and running ability. Yes, the armadillo can move along fairly quickly, in a hopping fashion, if need be. Armadillos will not bite people, or anything really. They have teensy tiny mouths with small pegs for teeth. Most people seem interested in the fact that armadillos can carry the human form of leprosy. Armadillos inhabit an old branch of the evolutionary tree - the basic design is unchanged in, I don't know, maybe 30 million years or something like that. These animals are often studied in fertility research due to another unusual trait: they always give birth to four identical twins: that's right, the embryo splits into four before development. How curious! I don't think that female armadillos give birth every year, because I simply don't see many litters of young running around. I do see it from time to time, but it's not like the sudden burst of newborns that accompany say, mother squirrels. The young dillos are born in March, and seem to take a year to fully mature. Once they reach full size, about 12 pounds, they stop growing, unlike some other mammals. Go ahead and try. In over half of the cases that I take on, the customer has already purchased all matter of magic "armadillo-b-gone" or "armadillo-away" type repellents. These repellents are usually comprised of either naphthalene (moth balls) or predator urine (fox or coyote) or castor oil. I've personally observed dozens of cases in which customers have loaded their yards with these sorts of gimmicks, or even poured entire boxes of mothballs or bleach down armadillo burrows (NOT good for the environment) and it doesn't affect the armadillo's behavior one bit. The animal just kicks the mothballs out of the way and continues to use the burrow. As usual in wildlife control, there's no cheap and easy solution. If you are unable to catch them yourself, your best bet is to call out a professional. You also have the option of trying to prevent the armadillos in the first place, but the reality is that it can be very difficult, and the only surefire thing that keeps them away is a sturdy fence around the perimeter of the property, one that extends underground, so they can't dig underneath it. You also have some other options for how to keep armadillos out of the yard or garden, mostly through discouraging landscaping such as gravel or heavy wood chips that they don't want to dig through. It is the armadillo’s natural tendency to dig. They have powerful legs equipped with strong claws, and like most burrowing animals, can dig amazingly quickly, often throwing mounds of dirt out behind them as they plow the earth. They dig for two primary reasons: first, they make burrows underground in which to live and raise young. They also often dig several shallow (2-4 feet deep) holes in their range in which to escape should danger arise. The second reason for the digging is food. An armadillo's diet consists primarily of earthworms and beetle larvae (grubs) and sometimes other insects. They have an amazing sense of smell, and root around on the surface, snuffling out food. When they detect it a few inches below the surface, they quickly dig and root their nose in the hole, and lick out the invertebrate with their tongue. Armadillos are nocturnal animals, and do most of this foraging at night, although they will occasionally emerge and become active during daylight hours, often in cooler weather or after a good rainstorm - when the worms come up. They usually sleep during the day, deep inside one of their burrows. They usually have a favorite burrow in which to den. No, not at all. Like all animals, they inhabit their own specific niche in the environment, and are well adapted to do what they do. They are simple animals, and amongst the least intelligent of nuisance species that trappers deal with. They don't really provide many benefits to the ecology of the land, and in most cases in the US, are not native to the area. However, they usually don't cause a whole lot of harm in the wild. The conflict usually occurs, as mentioned, due to their proclivity toward digging. Many people work very hard and spend a lot of money on landscaping, and they simply do not want it destroyed. Furthermore, in the event that an armadillo burrows under some structure, be it a deck, sidewalk, AC unit, fuel tank, or the house foundation itself, the dillo causes a threat to the integrity of the object - that is, with less dirt underneath the object, the object might collapse, or in the case of concrete walkways, crack. If an armadillo starts to dig under a vulnerable object on the property, it might be a good idea to have the animal trapped and removed from the area. But you can catch them live and relocate them. You don't have to kill the Armadillo.